Erasable pens are a pretty cool new invention that allows you to write in beautiful colors and bold inks while still being able to erase them as if you were using a pencil. We’ve compiled a list of the best erasable pens, both in different colors and regular black and blue. This way, you can choose the erasable pen that is best for you and your purpose! First, let’s take a look at some things that you should know. Package Size: This refers to the number of pens in the package. Knowing how many pens that you are getting can tell you if the price is worth it, and you will know if you have as many as you need. Color: The colors of the pens are blue, black, or assorted. The assorted colors will be listed in the review, and some of them especially are beautiful deviations from the normal set of rainbow colors, and we love them! 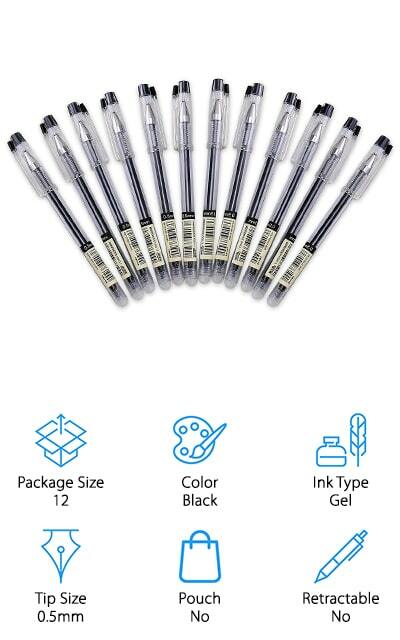 Ink Type: The inks in these pens are either gel ink or ballpoint ink. Gel ink is vibrant and smooth, whereas ballpoint ink is usually more consistent and solid in the way that it writes. Both will erase the same way! Tip Size: The size of the time makes the size of the lines different. 1.0mm lines are thicker than 0.5mm, but all of these are medium lines that are great for writing and drawing, without deviating from standard pens. Pouch: Some pen sets will come with pouches or boxes for you to keep your pens in so that they don’t get lost or damaged. This is an amazing and rare feature that we actually really like! Retractable: A retractable pen has to be clicked for the tip of the pen to drop so that it can write. When a pen isn’t retractable, it means that the pen has a cap so it doesn’t dry. Now we can get to our erasable pen reviews! We’ve brought you only the best of the best so that you can choose a quality product for yourself! Our top pick is our favorite pen, while the budget pick is the most value for the money. When you’re finished looking at them, check out the rest of our list. It’s full of top-quality erasable pens as well. We’re sure you’ll find your new favorite writing tool! Our top pick is this pilot FriXion erasable pens review. 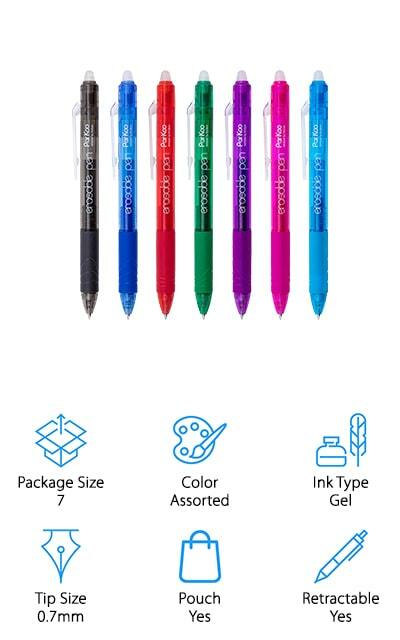 These pens are retractable and come in seven different colors, including pink, green, purple, red, light blue, dark blue, and black. These write so smoothly, and you can erase them completely with the friction eraser on the back of the pen. They also come in a variety of other colors that you can choose, which is pretty neat. These are the original FriXion brand pens, which are also refillable. They don’t leave behind a residue or any ink color when you’re erasing them, which we love. These luxury erasable pens are perfect for use in your office or on your desk, for making notes that you don’t even have to keep! The colors are vibrant and the friction eraser is soft enough that it doesn’t damage or leave a hole in the paper. The unique gel dissipates with heat, so there is nothing left behind after erasing! 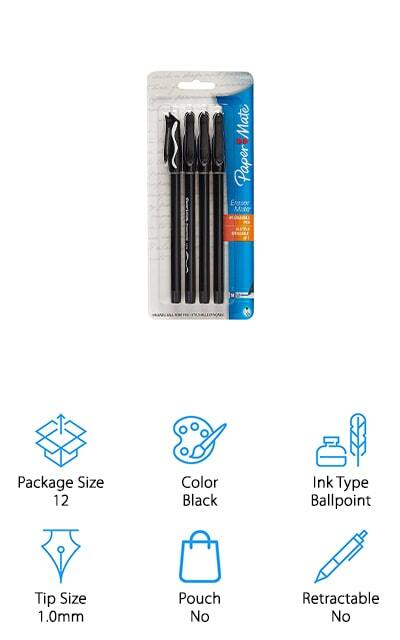 These affordable erasable ballpoint pens come in a simple black color, which is great for use on forms and other important documents. But you no longer have to worry about using white out, because these pens can erase anything you write down! The ink is erasable and works well, erasing most of the color so you can write over the same section of the paper and correct your mistakes without worrying. The ink within the pen is pressurized, so you can use it to write perfectly at a variety of angles. 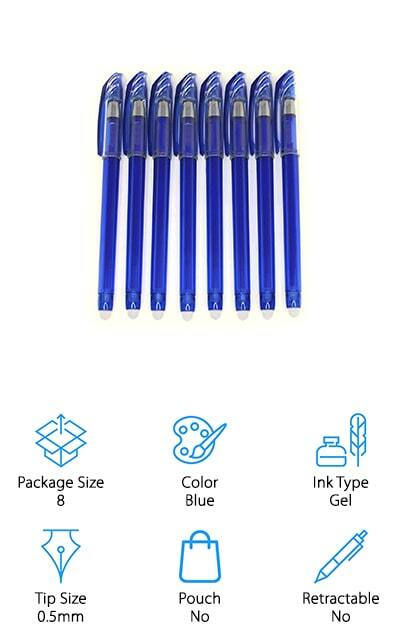 This order contains three packages of four pens each, meaning that you get a total of 12 pens in this set. It’s great to have a stock of these erasable pens around so that you can easily correct your mistakes, and even solve puzzles without stress! These pens have 1.0mm tips, so the lines they leave behind are fairly thick and easy to see. 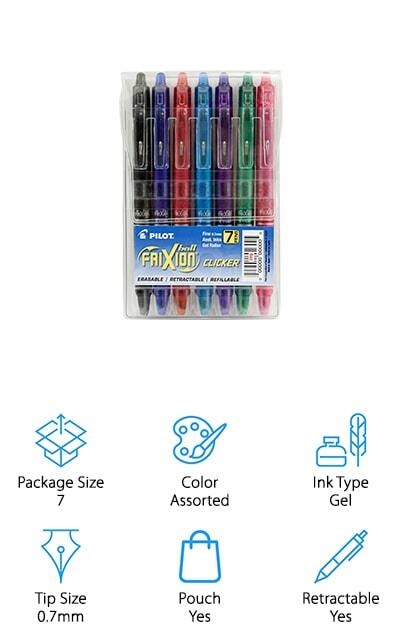 There are ten Pilot FriXion colors erasable pens in this package, in black, gray, blue, purple, hunter green, salmon, magenta, orange, red, navy blue, and pink. That’s a huge variety of color, and they all erase well! They write smoothly and the tips are a fine 0.7mm so that you can easily see the lines that they leave. Solve puzzles without making a mistake, and erase without damaging your paper on top of it. The friction erasers will remove all of the ink without a second thought, and without having to try and erase it a second time. It’s a gel pen, so it writes beautifully and erases as easily as a pencil, which we think is pretty amazing. And the colors are extremely vibrant and refreshing as well, and we love that there are so many of them! You can take your organization to the next level with these beautiful and erasable pens!. These erasable pens by ParKoo are an excellent alternative to the cheap pilot FriXion erasable pen. 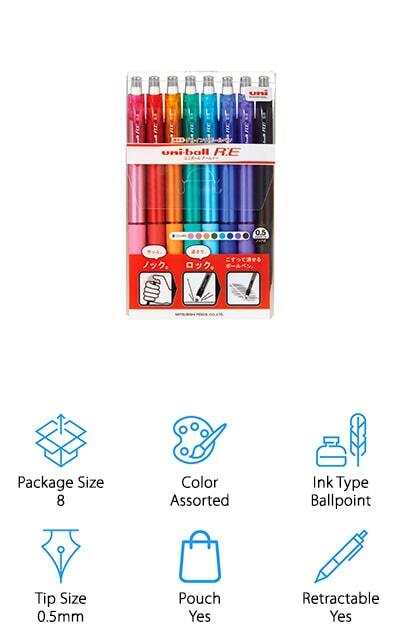 There are seven in this pack in assorted colors, including two different shades of blue, green, purple, pink, red, and black so that you can make notes in all of your favorite colors. The ink is smooth, so you can write without any interruptions. And if you make an error, simply use the friction eraser on the back of the retractable pen to get all of the ink to disappear due to the heat. The ink is non-toxic and acid-free, and the eraser is gentle enough not to leave a hole in the paper when you’re done getting your mistakes out. We love that they even include a purple erasable pen, which is super intense and beautiful and erases just as well as the other colors! With the use of these pens, you can keep your calendars and journals looking clean and perfect! The BBLIKE pen is a fine line tool that is comparable to the Pilot FriXion 0.5mm erasable pen. The lines are beautiful of medium thickness, perfect for solving puzzles or making notes on your calendar. The erasable function makes it easy to change dates and appointments as needed. It easily and efficiently gets all of the ink back off the page when you need to, leaving you with a blank space to make a correction. Some erasable inks will come out unevenly, but this pen delivers smooth, beautiful writing. It’s easy to hold and use, and the ink dries quickly after writing. This particular set of 12 pens comes in black only, so you can write on all of your formal documents without the fear of making a mistake! We also love that the ink doesn’t smudge easily and won’t fade over time. We love how smooth the ink comes out so that you can make confident lines! The BBLIKE Erasable Rollerball Pen has gel ink, which writes smoothly and fluidly. 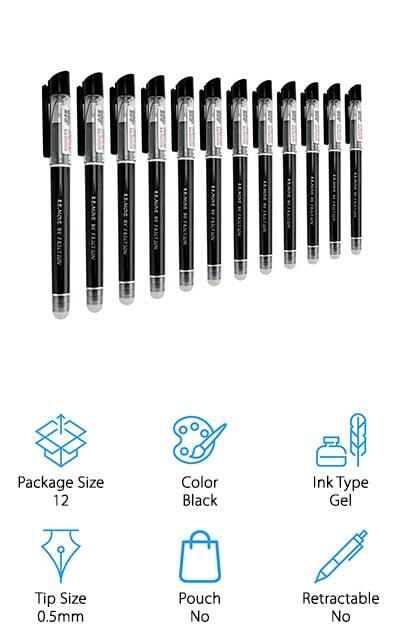 They’re a good affordable alternative to the Pilot E Gel erasable pen, and it has the same quality that you’ve come to expect from that company. The hard eraser on the cap will erase any mistakes that you’ve made by rubbing off all of the ink. These pens are a smooth black color, which goes on nicely and comes off just as nicely! Plus, the ink doesn’t fade over time and won’t smudge easily, as it dries fairly quickly after you’re finished writing. It’s great for drawing and scrapbooking as well as official documents and journaling. Don’t use correction fluid! What we love most about this pack of 12 gel pens is that it comes with 20 gel pen refills, so you can keep using them again and again! They are 0.5mm tips that give clear, non-bleeding medium lines! This is a great deal! 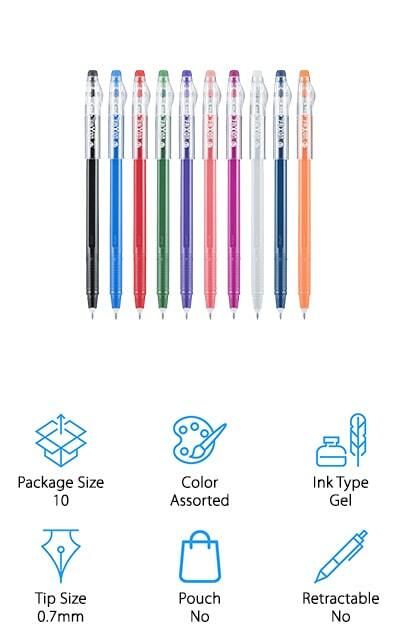 Xiamei makes these erasable pens in assorted gel colors. 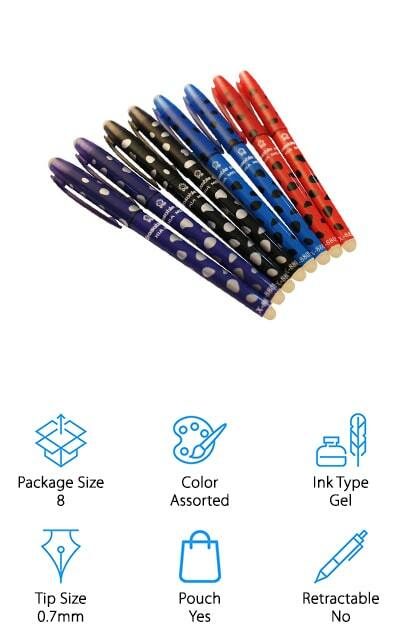 There are eight stylish pens in this pack, including two red pens, two blue, two black, and two purple erasable pens. Each pen has a hard rubber eraser on the end so that you can easily get rid of any mistake that you make. In fact, there are even other varieties of these pens if you’d like to get a pack with different colors. We love the polka-dot design on the pen wrappers – they really make these stand out. They have a 0.7mm fine ballpoint tip and look and write very much like the FriXion erasable pen. You can get clean lines from these pens, and then erase them and rewrite a few times without damaging the paper. It’s acid-free, nontoxic, and will go great with a ton of crafts and activities, from journaling to writing and drawing. We love the look and feel of these pens! These erasable ballpoint pens by Uni-Ball come in eight amazing, light colors. The 0.5mm tip size can make clear, crisp lines that are easy to read and won’t bleed. We do love that the colors are light because that means that they will erase better. The included colors are pink, red, orange, green, light blue, dark blue, purple, and black, so you have plenty of options when you go to write or to take notes. These are well-made, beautiful writing instruments that you can use for a variety of activities including journaling, scrapbooking, and even adult coloring to an extent! Even though the colors are understated, they are still pretty beautiful, and you can retract them when you’re finished so you don’t have to worry about losing the cap. They have a comfortable grip that you’ll love to use! We love these affordable pens that are a great first step into the world of erasable pens. These erasable gel pens by Bild look and write wonderfully! 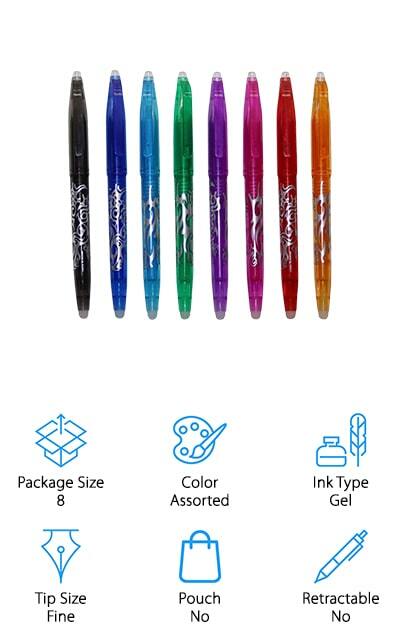 Much like the FriXion heat erasable pens, the ink in these pens are heat-sensitive, so the ink dissipates at a certain high temperature most readily created by friction. There are eight assorted colors in this particular pack, including orange, red, pink, purple, green, light blue, dark blue, and black. Each pen has two separate erasers, one on the bottom of the pen and the other on the cap. It’s comfortable to hold, and the eraser on the cap is great if you like to put the cap on the end of the pen so you don’t lose it, as a lot of people do. The ink in these pens writes smoothly and comfortably, and erases just as well! They are affordable and fun to use and the colors are very bright and vibrant as well, which is something that we absolutely love. We know you will too! Hieno makes these blue gel erasable pens. They write smoothly with their beautiful blue color, and you won’t have to worry about mistakes! The rubber tip at the end of the pen does a great job at getting rid of the ink through friction, which is pretty amazing and won’t damage the page you’re writing on. When introduced to friction or heat, the ink turns transparent so that you can write over the top of it and your new writing will be completely legible. The tip size is 0.5mm, for medium sized lines that are easy to read. Plus, Hieno definitely makes this pack of 8 pens more affordable than some of the name-brand competitors. They have an ergonomically designed grip so that you can comfortably write with the pen, and that’s a huge bonus if you plan to use them a lot! They come in a paper box that you can keep your pens in after opening!